Want to work with animals? Want to help people? Becoming a service dog trainer is one of the best ways to both work with animals and helping people. To achieve that you want to know how to become a service dog trainer! A service dog trainer is someone who trains dogs who will go on to be owned by a disabled person. For disabled people, tasks that we do every day, such as picking up dropped items, closing doors and generally getting around, can be tough. Having a trained dog can seriously help a disabled person, and even give them a new lease of life. It’s not uncommon for a disabled person and a service dog to have an unbreakable bond, as these dogs are trained to be loyal and compassionate to their owners. It can be extremely rewarding to be a service dog trainer. Not only do you get to spend time with creatures who you have an affinity with, you are also aware that your hard work is helping create life-long companions for some of the most vulnerable people in our society. So how do you become a service dog trainer? Generally the best way to become a service dog trainer is to gain practical experience working with dogs and learning on the job. You may already have your own dog, but this experience is not enough. You need to be in an environment where you are meeting lots of dogs. Ring all your local dog shelters and see if you can volunteer your time. You could also try ringing veterinarian surgeries, animal hospitals and kennels – anywhere where there will be many breed of dogs for you to meet and gain experience with how to become a service dog trainer. The more experience you gain, the better. Many people dream of being a service animal trainer. Having lots of experience with different breeds will help you have the edge over the competition. Look for service dog training classes or workshops in your area. They are likely to be held by universities or community colleges. You want to look for courses that specialize in breeds, temperament, dog behavior, animal health issues, and how to become a service dog trainer. Search for an apprenticeship course on how to become a service dog trainer. A good place to look is the National Association of Service Dogs or the Certification Council for Professional Dog Trainers. You will be taught by an experienced service dog instructor. These courses can be long (on average around 4 years) as there is a lot for you to learn, such as training dogs in public access skills, manners, and completing tasks to help people with issues with sight, hearing and mobility. Although a long course, this can be very gratifying, especially as you will come into contact with members of the public who have disabilities, and teach them how to work and look after their service dogs. Some states require you to obtain a license to become a service dog trainer. Check with your state attorney general’s office to see if you need one in your state. By this stage, you would have had many years of experience with dogs, as well as the skills to train dogs to be effective service animals, and the skills to train disabled people on how to work their service dog. It’s time to apply for a position as an instructor. Search online for ‘service dog trainer’ positions. Different employers will want different things. 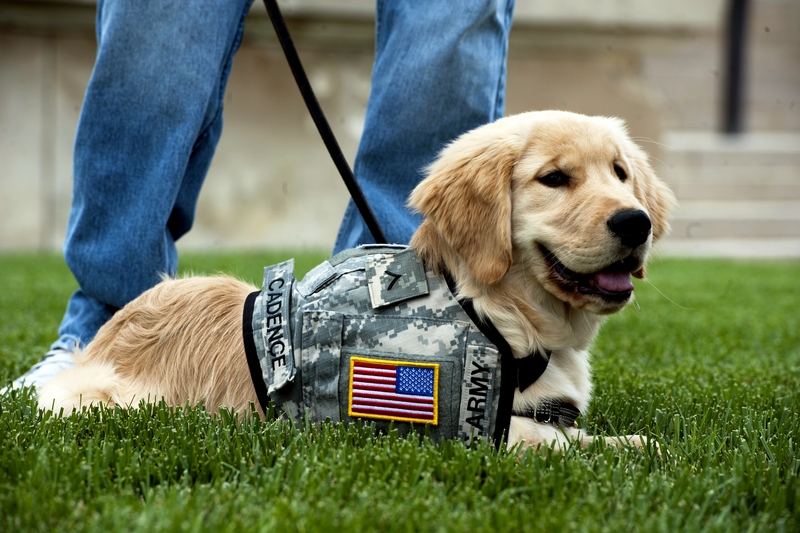 But in most cases, you will be expected to be physically fit as most service animals are large, sprightly dogs, such as Golden Retrievers, Labradors and German Shepherds (or cross breeds). Your work is mainly outdoors, running around with dogs. It simply won’t do to have a service dog trainer that cannot keep up with the dogs. Personality traits an employer would look for are patience, excellent communication skills, compassion and excellent people skills. Of course, you must also display a love and passion for dogs! Also, some employers will expect you to pass written exams, and may even require you to participate in field tests. How do you become a service dog trainer? With lots of hard work! It will take a number of years to get there, but if you want to have a fantastic career spending time with animals you love, and know that your work is helping vulnerable people get the best out of their lives, then you will not be put off by the above. Being a service dog trainer is an incredibly rewarding career! We hope this guide on how to become a service dog trainer has helped you and gave you some insights! Good luck! Most dog trainers love dogs and training dogs. This is only the beginning. If you have ever trained a novice class of individuals who have never trained a dog before you know that training dogs is the easy part. Training people to train their dog or maintain their dogs training is the hard part. Now add to this that you have to train a person who is not as able to move with, motivate, correct, and in some cases understand your instructions right away. I really appreciated this informations! Dog training is such a rewarding job. I know that when I have trained someone’s dog that they originally thought was un-trainable, it brings me great joy. Check it out and see if it’s the right fit for you! It’s helpful to have this knowledge ahead of time of actually going through the training. Often times people don’t know what they’re getting into when wanting to become a service dog professional.